Yes, it's remarkable, Yellow Pages still exist in paper form. 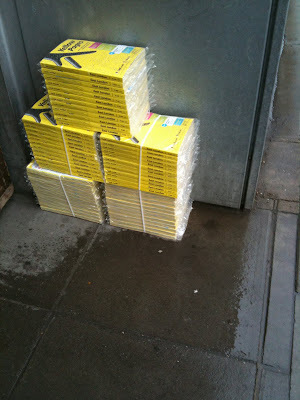 This pile of 60 copies was delivered to our front door last week - and sat in the rain for two days until they were thrown in the compactor. I'm amazed that they are still produced, as most people surely find a plumber/mechanic/solicitor or whatever via Google or some other such search engine. In fact, you might even use Yell.com. their own search facility. I wonder how long they will continue to convince all their small businesses and tradesmen that it is worthwhile to pay to be listed in a paper directory.